KATIE: Ok, our next dancer is "Waffles." C'mon in, Waffles. Tell us a little bit about yourself. WAFFLES: Uh, my name's Waffles? I'm almost 3 years-old? WAFFLES: Uh, hobbies? Um, working out. I work out. With wand toys and red dots and stuff. KATIE: Waffles, it says here you want to be a rancher. Don't you mean dancer? 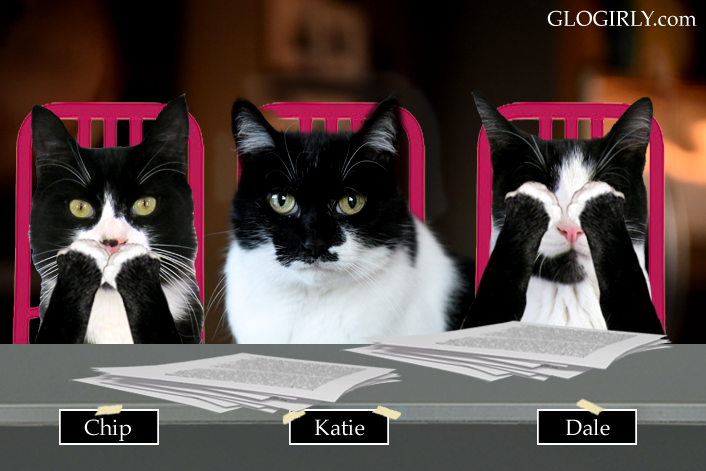 KATIE: (talks softly to other judges) Well this is disappointing. This cat's got no experience. 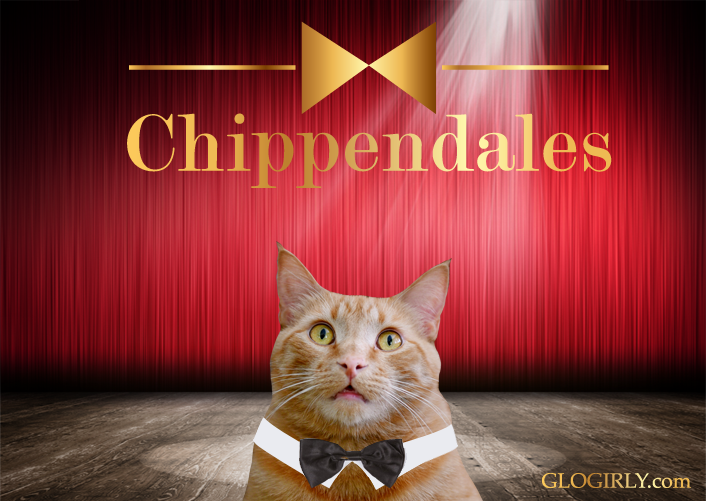 He doesn't even know what Chippendales is. Chicken? Seriously? CHIP 'n' DALE: Got it. KATIE: Ok, Waffles. Show us what you've got. When we heard about Chip and Dale, the adoptable tuxedo brothers from PAWS, we couldn't help but giggle at their clever names. Growing up, Glogirly loved the Chip 'n' Dale cartoons. She still has a thing for chipmunks. Fast forward to 1990... back when Saturday Night Live was must-see television. In October of that year Chris Farley and Patrick Swayze starred in what Glogirly thinks is the most hilarious comedy sketch EVER. If you've seen it, you know what we're talking about. If you haven't, you owe it to yourself to WATCH. If you live outside the US, click HERE to see the video. Every Saturday we're featuring adoptable cats from PAWS Pet Animal Welfare Society in Norwalk, CT. in our TV Trip blog series. 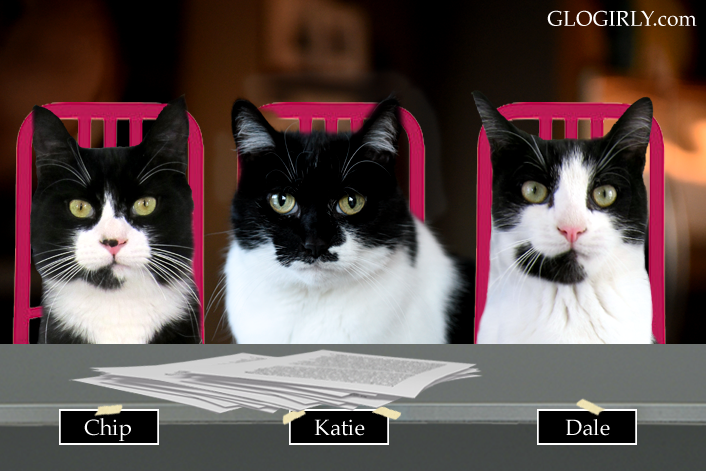 Through the magic of Photoshop, they'll join Katie and Waffles for some time-travel adventures in our TV Trip blog series. Chip and his brother Dale are barely out of kitten hood at 1 year old. They're a playful and affectionate pair, once they get to know you. These sweet tuxedo brothers were found in a feral colony, but a volunteer lovingly fostered them and taught them the joys of being with people. 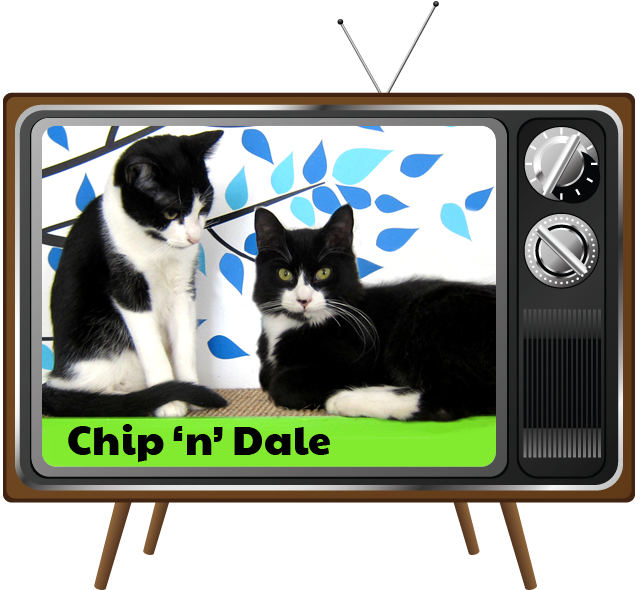 Chip 'n' Dale are looking for a forever home where they'll always be together. These handsome boys are available for adoption at PAWS, Pet Animal Welfare Society in Norwalk, Connecticut. 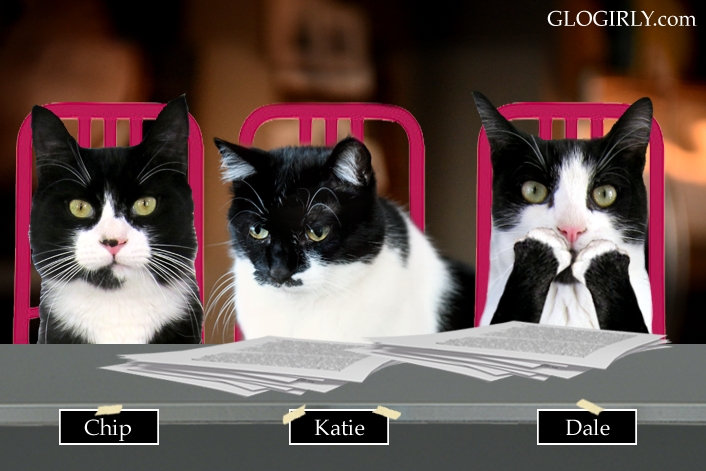 This is one of our favorite Caturday posts from 2015. We loved it so much we wanted to share it again. Since we originally posted it, Chip 'n' Dale have been adopted. But there are still many wonderful adult cats waiting at PAWS and shelters in your own neighborhoods for their forever homes. If you're ready to add a furry family member into your home, please consider adopting an adult cat. Our Mommy remembers that sketch. Bwahaha! MOL! Keep working it Waffles!!! You can do itt! My human has seen that sketch, of course... but she had to watch it again. It made her sad, though, that both of them are gone now, even though she laughed lots. Um, Waffles? You're gonna have to work harder to be like Patrick Swayze. Or even Chris Farley! Thanks for featuring Chip and Dale! Mom's favorite sketch too! The place she got her Tshirts made sell the cutest little cat collars just like Waffles is wearing. Too small for anyone in this house. Purring hard for great homes for sweet Chip and Dale. You would make a great Chickendale Waffles! I hope Chip and Dale get adopted soon. I couldn't watch the video because it is not available here. 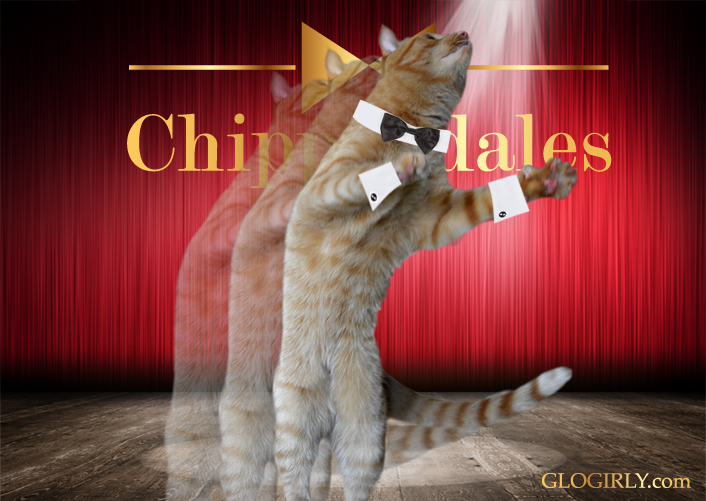 Well, you do have some pawsome moves, Waffles. I remember that sketch too. Too funny. The CHICKENdales made me laugh. Awesome to see Chris Farley in action again. Not so awesome to see Waffles crash and burn like that. Keep your spirits up, Waffinator! Finally you are playing the hunk of a man cat role that you were born for Waffles..lol..
Work it Waffles....we KNOW you can do it!!!! Waffles has the 'moves' - that's for sure!